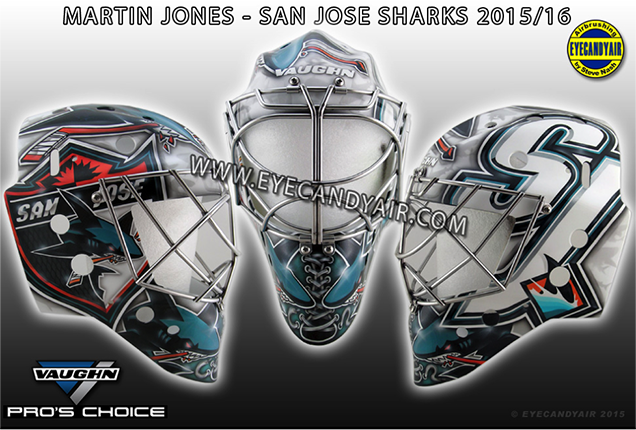 Even with the start of the 2015-16 almost 2 months away, more and more new masks are being unveiled by the day. We’ve already covered some of the early bird releases, so it’s time to check out the next wave of buckets debuting on October 7th. 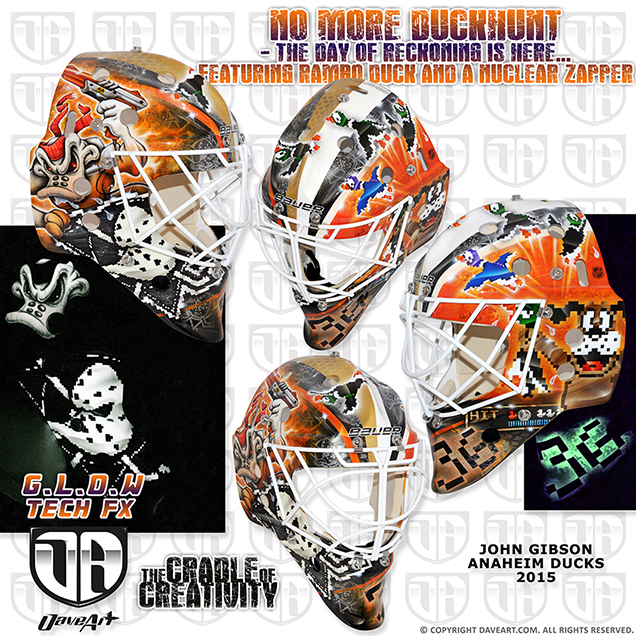 There are few things that could touch Gibson’s Pac-duck mask from his breakout season in Anaheim, but artist Dave Gunnarsson helped the Ducks netminder channel his love for video games once again with a pixelated Rambo-Duck Hunt themed bucket. 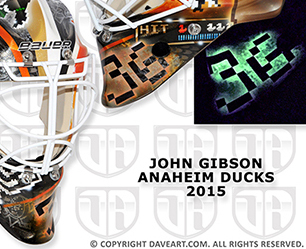 Aside from the questionable decision of putting dying ducks onto a mask when you play for the, um, Ducks… Gibson has created a signature style for himself with this video game and pixel art realm. 8-bit design has been relatively trendy as of late in the hockey world, yet Gibson’s been the only netminder so far to incorporate the retro fad into his mask. There’s a mixture of many styles in this design and a lot to digest, so let’s break it down one piece at a time. The first thing to notice here is the abundance of pixelated graphics, from the ducks and dog on the left side to the Mighty logo on the right and number on the chin. Having these elements dispersed throughout the mask is important to help create some sort of balance in this over-the-top design, but the off-centered 36 completely throws me for a loop here. With everything going on, the sense of symmetry created by the striping on the top and what would be the grounded number in the bottom center is crucial, but it almost seems like an afterthought because of the placement. 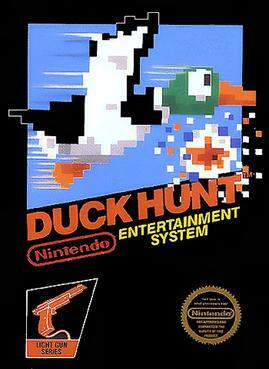 In addition to the bevy of 8-bit fowl roaming around this mask, Gunnarsson also gave Gibson a comic book-style Rambo duck on the right side of the mask, leaping over the pixelated logo. 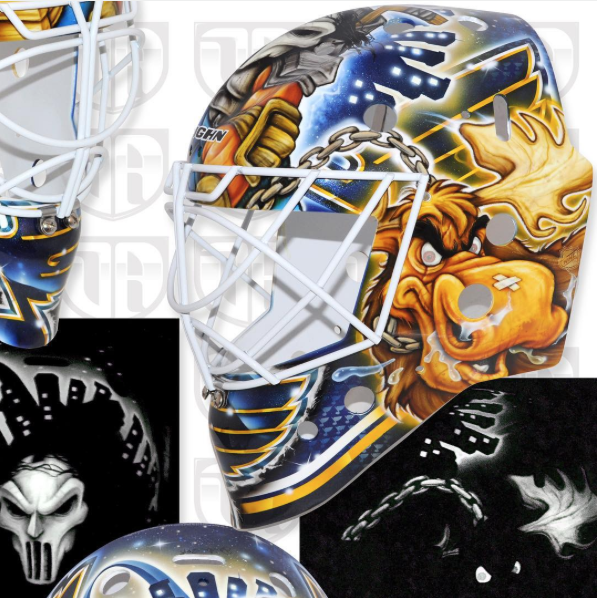 Again, because there’s just so much going on in this design, I think it would’ve worked in Gunnarsson’s favor to stick to one style as he did in the pac-duck mask. It creates a bit of a disjunction from the retro video game feel and because of the size, distracts from a lot of the detail work surrounding it. That brings us to the final component of this mask, which of course is in the details. If you’ve seen or read anything about Gunnarsson’s work before, you know it’s always loaded with special effects, hyper-detailed patterns, holograms, and of course glow-in-the-dark paint. 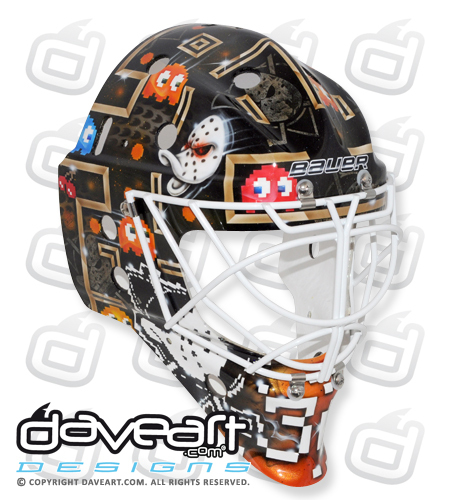 This mask is no exception, and if you look past the characters in the foreground, the background is full of beautifully painted details like subtle Anaheim logos and netting texture. Unfortunately, so much of this gets lost, which is really a shame given how much care and craftsmanship clearly went into creating this. Overall, I’d say this was a step down from Gibson’s buzzed-about mask from last year, but Dave promises more work coming for John this season, so stay tuned! With a speedy summer shuffle between Los Angeles, Boston, and finally San Jose, it seems Martin Jones has finally found a home for this season with the Sharks. 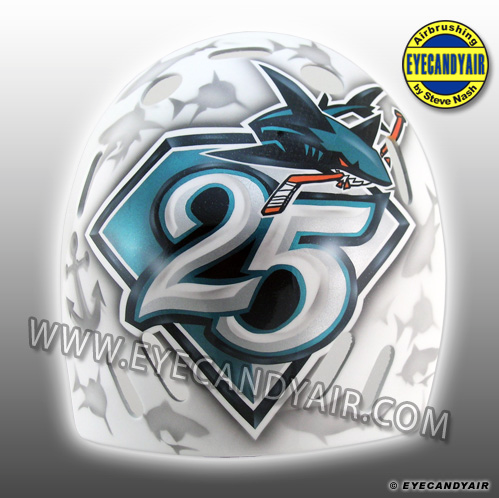 After crafting a string of LA Kings masks for Jones, long-time artist Steve Nash of Eyecandyair took on the challenge of incorporating the Sharks’ unfortunate 25th anniversary logo into something even remotely contemporary and cool. 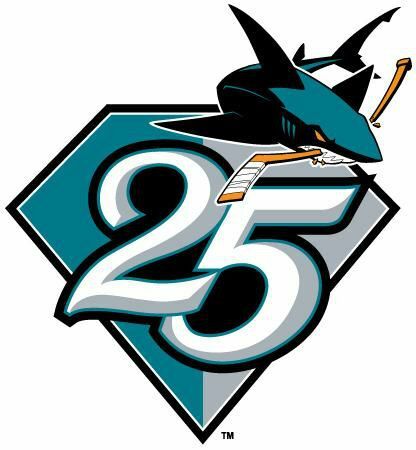 While it’s pretty dreadful on a jersey, the 25 year logo actually doesn’t look so bad when isolated on its own. 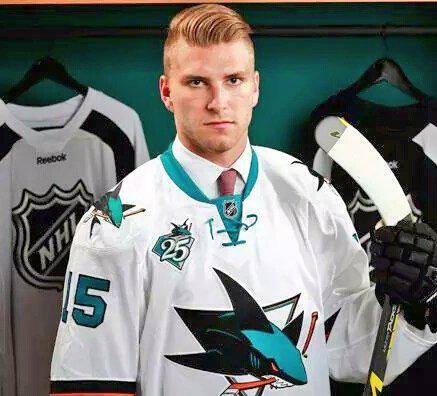 Keeping it seperated on the backplate, away from any of the other three variations of teal shark logos that San Jose now has in its brand package, Nash was able to create a crisp and clean design that pays homage to the team’s history. In addition to the commemorative logo on the back, Nash has placed the primary shark logo directly on the top with two others facing each other around the chin of the mask. Each side boasts one of the team’s alternate logos, both of which were first introduced in the late 2000’s. 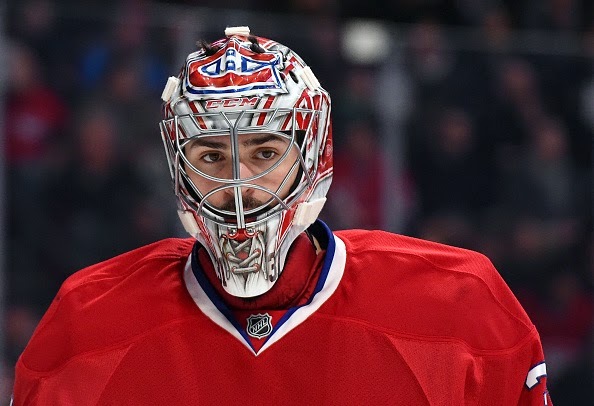 The lace detail on the chin also adds a nice touch, something other artists and goaltenders like Carey Price have taken a shine to as well. The simplicity of this mask is really what makes it successful. Nash has carefully kept the focus on the logos, using a white background with shadowed anchors and sea creatures to fill in the negative space. While Jones’ mask may not be as dynamic or flashy as some of his colleagues’, there is something to be said for a beautifully executed, clean and simple design, and here Nash has done just that. Not straying from his signature razor design, King Henrik will be sporting another silver crown on his mask this season, complete with Statues of Liberty and chrome detailing. 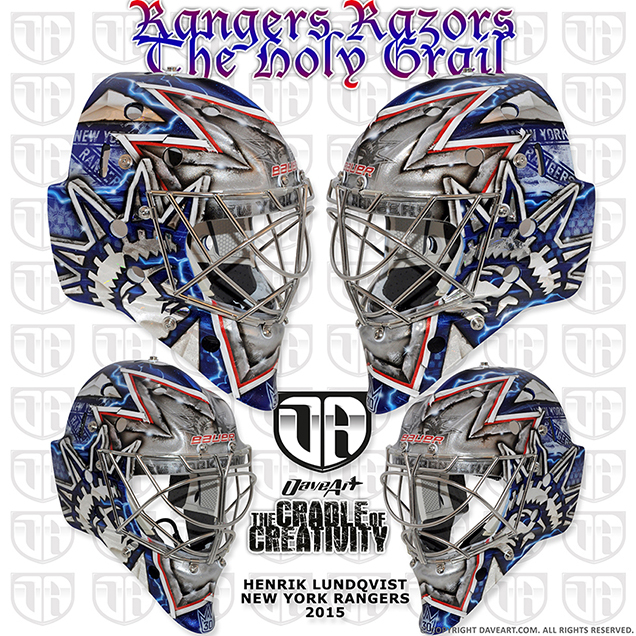 Like last year’s, this design is the ultimate tribute to both the Big Apple and Hank’s home country of Sweden. 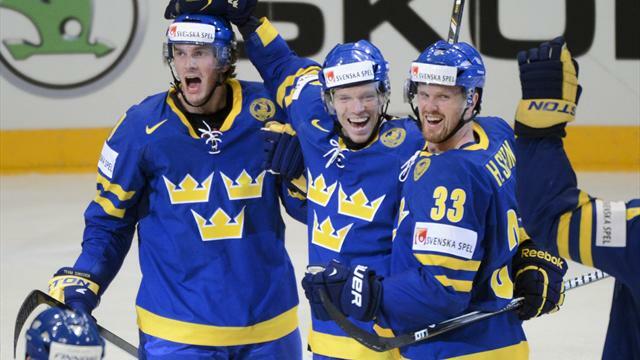 The crown in the center combined with Lady Liberty’s on each side mimics the three crowns (or “Tre Kronor”) of the Swedish national emblem, and the reference to New York? Well, it’s pretty clear. In addition to the slick silver landmarks on each side, Gunnarsson threw in some bonus special effects, creating a mesmerizing pattern of sorts with Rangers logo holograms throughout the background of the design. While the changes from last year’s design are minimal, I think Gunnarsson made some impactful design upgrades in this iteration of the razor crown. Last year, I pointed out the downside to the glitter effects, which unfortunately brought back memories of that wretched adhesive craft paper (fun), yet this year, Gunnarsson opted for a smoother chrome finish, which is far more sophisticated. This mask also uses more blue and less silver, which will create more contrast against the white of the ice. 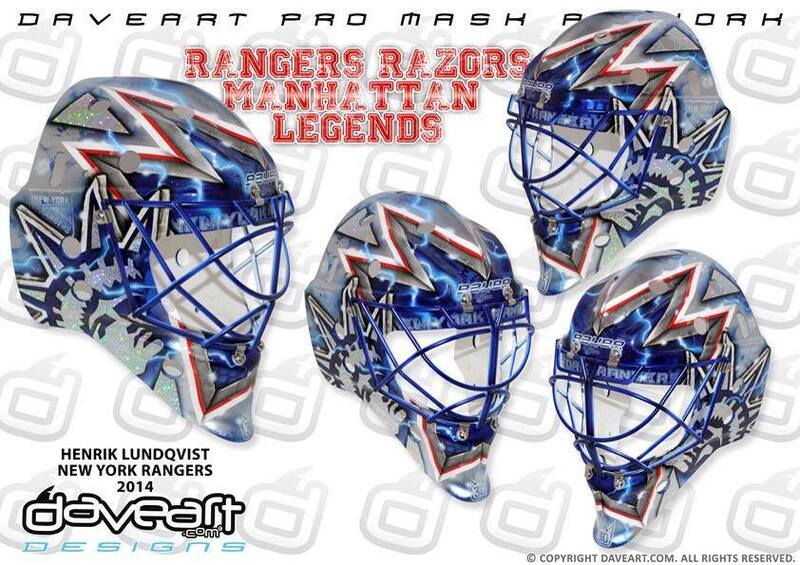 The only downside I see is that Lundqvist and Gunnarsson have chosen to go back to the silver cage instead of sticking with blue, which in last year’s design was a nice element, but overall, this mask is a nice step forward in the evolution of Hank’s signature design. 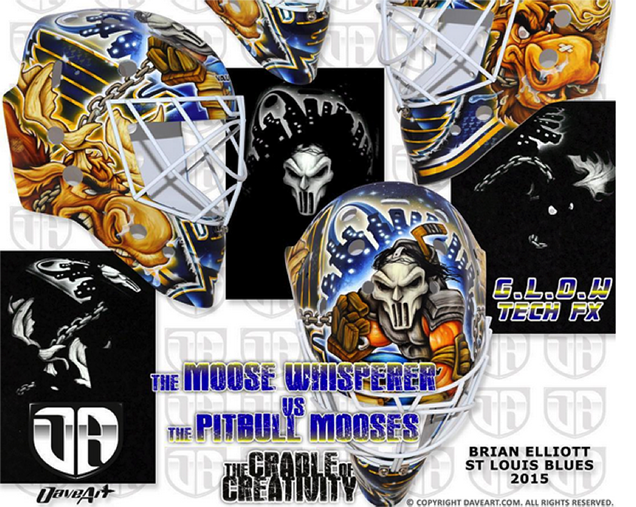 Like in all of Gunnarsson’s work, this mask has a lot going on, from the glow paint to the angry moose to the intricate detailing in the background, but what makes it successful are the balance and visual hierarchy of the design. The angle of the musical note tails and the moose chains along with the striping around the chin help lead your eye around the mask, noticing every different element in the design one at a time. Gunnarsson promises more work to come with Elliott this season, so stay tuned for the next chapter(s) of Casey Jones’ moose whispering! After a breakout season in Ottawa, “the Hamburglar” (aka Andrew Hammond) returned to work with his artist from last season, Jason Bartziokas, who he’d originally met through fellow Sens prospect Chris Driedger after training camp. His rookie bucket had a fairly simple design with the Ottawa “O” logo and fast food delinquent on one side, and the primary Senator logo on the other. Bartziokas left the negative space white, filling in some dead spaces with faded gray logos and finishing off the design with a red and black striped border around the edges. The Hamburglar 2.0 mask hasn’t changed much since 2014 in composition, but due to the chromed look of the oh-so-unfortunate Sens’ anniversary logo, Hammy’s mask has presumably been given the same treatment. The Hamburglar still sits in front of the O logo on the right side of the mask, this time swinging in on a wrecking ball (perhaps Hammond is a Miley Cyrus fan?) through a red brick wall that spans across the chin of the mask. Bartziokas had a little fun with Hammond’s nickname on the wall, playfully replacing the M’s with Mickey D golden arches. The chrome treatment on the primary logo here doesn’t induce the same cringe-worthy reaction as on the anniversary logo itself, given that the shadow and highlight placements on the mask are thoughtfully executed and don’t mimic a default setting from Windows ‘97 word art. The background of the mask has also been spruced up a bit with some extra faded logos creating a more intricate and detailed wallpaper-like effect. Given his breakout success and marketable nickname, I think it was wise for Hammond and Bartziokas to stick with last year’s theme and not try to reinvent the wheel. For Hammy’s sophomore season, he gets a little extra flash added to an already successful design. Edit: On a more serious note, Hammy’s mask isn’t just about fast food. 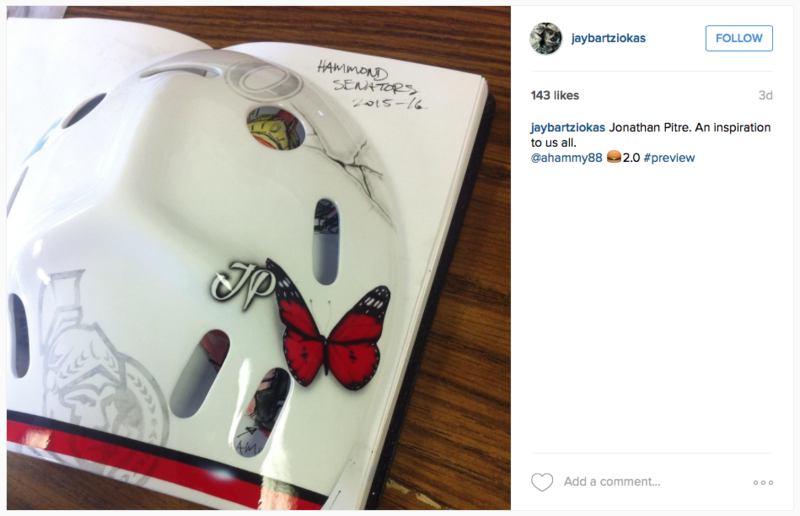 With a small red butterfly on the backplate, Hammond pays tribute to Jonathan Pitre, an Ottawa teen suffering from Epidermolysis Bullosa (EB), a disease that makes the skin so fragile that it blisters and scars even from the simplest tasks like eating, bathing and even breathing. Kids with EB are often called “butterfly children” because of their skin’s extreme fragility like butterfly wings. To read more about Pitre’s advocacy and his impact on the Senators team, check out these recent features in the Ottawa Citizen and on NHL.com.